The UCR Microbiome Initiative brings together UCR researchers from multiple fields and across our campus. Microbiome Science is multidisciplinary by nature and spans diverse research objectives, including i) human health and disease, ii) animal microbiomes in natural systems, iii) environmental microbiomes, iv) microbiomes in agriculture and plant systems, and v) mathematical and computational approaches to microbiome science. The main goal of the Microbiome Initiative is to foster interdisciplinary interactions among these fields and to leverage the existing resources here at UCR to promote Microbiome Science. 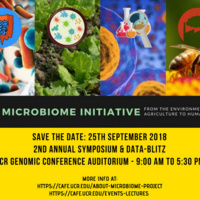 This symposium is part of a coordinated effort by CAFE to accomplish the above goals and create better opportunities to use and share resources among labs, enhance infrastructure, create training activities for students, facilitate funding requests for large projects, and to reach out to stakeholders outside UCR to identify research needs and gaps.